This article is about free tools for making machimima movies for YouTube and Vimeo in Second Life. I have always used Fraps, a very nice $37.00 program, to record videos in Second Life. But Fraps will only record the game itself. I needed to do some movies about writing web pages and how to use other tools, so I searched for a free alternative that works in Second Life as well as on your desktop. 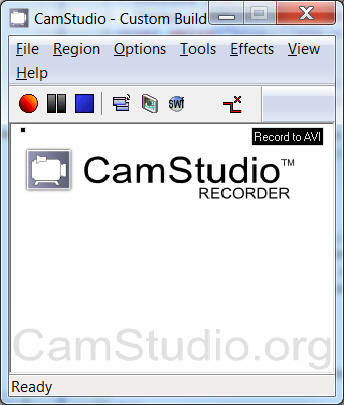 Camstudio is a free tool for recording video of your entire desktop, a specific region, or a window. It's perfect for recording Second Life videos, and best of all, its free! You can get the free version at http://camstudio.org/, or download it for Windows at this direct link to SourceForge. Camstudio gives you control over the output of your video: custom cursors, and to record the whole screen or just a section of it. 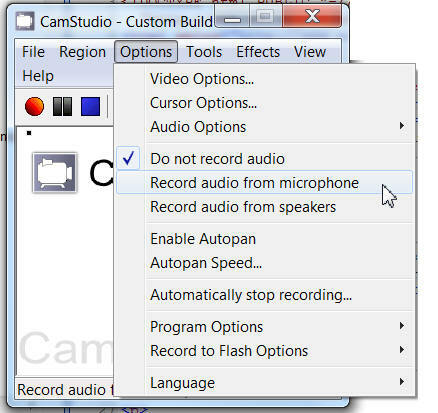 You will need to set up some of the options in Camstudio before recording video with it. The first one to do is to click Region and then select 'Window'. 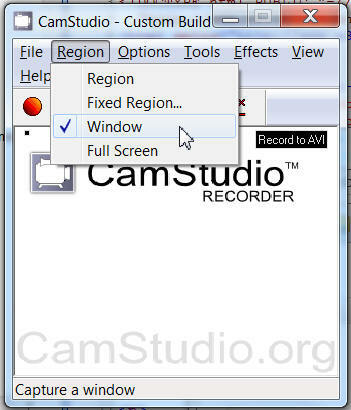 When you start to record, Camstudio now will ask you to click the window you are going to record, which will be the Second Life viewer. You will need to decide if you want to record the audio. You can disable it entirely, or record just your voice, or record the Second Life audio stream. You will need to decide if you want to record the cursor. You probably will need to disable the cursor when you are recording a machinima. If you are recording an example video, you may want the cursor to be shown. Click the Options menu and then select Cursor Options. 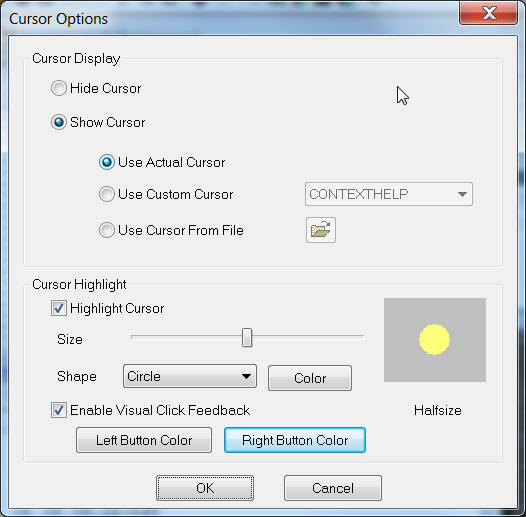 Now select Show Cursor or Hide Cursor. I have also enabled my setup for "Enable Visual Click Feedback". You will want to disable this for machinma. 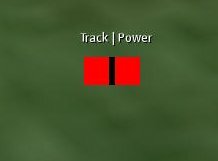 Visual click feedback will display the left and right-click motions on screen as different colored circles. I do a lot of video recording in Second Life, and I want to be able to put the video in different folders. This option is located in Program Options, as shown below. I chose "User Specified Directory". 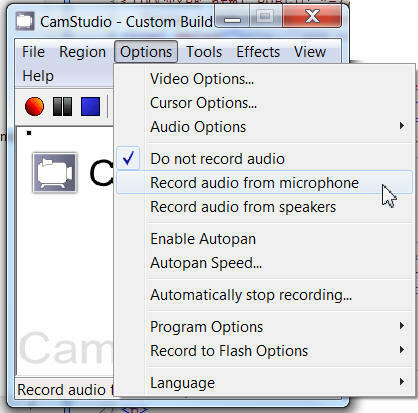 Now that you have Camstudio set up, click the Red Record button, pick a window, and then click the Stop button. A video should appear on your screen. 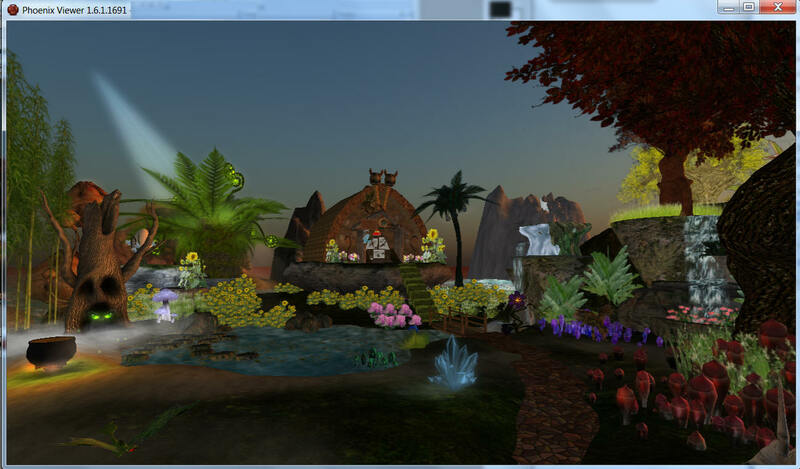 In this section I will show you how to set up the Second Life viewer. 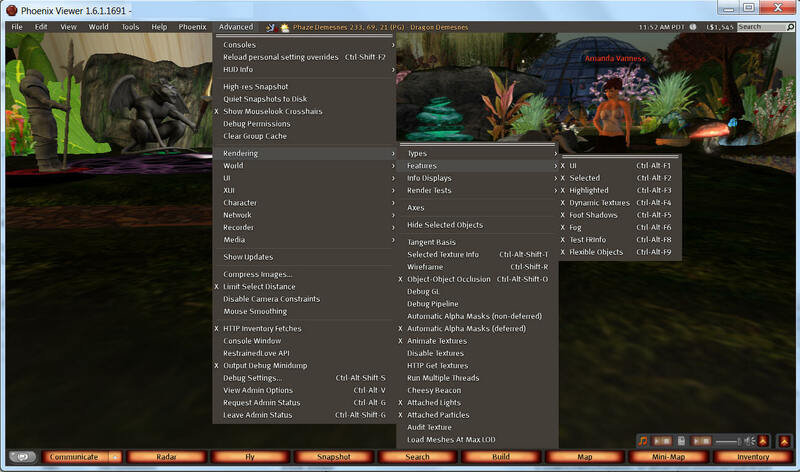 Second Life viewers have their screens cluttered with HUDS, the User Interface (UI) is visible, and the screen may not be the correct size for recording a video. You will need to make a few changes to some of the settings to fix this so you have an uncluttered UI. The first thing I do is change my video size by clicking Ctrl-P and going to the Graphics tab. 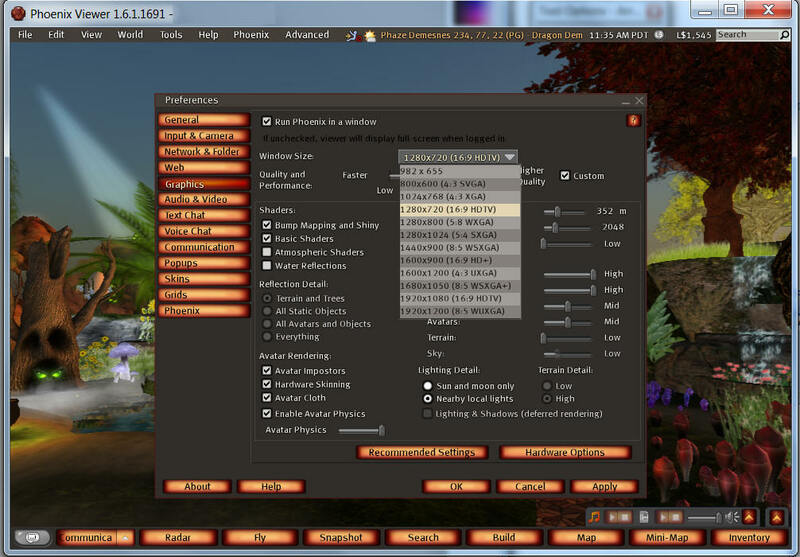 This screen shot below shows Phoenix, but the same settings are available in all viewers. I chose to record in 1280X 720 HDTV format, which is a wide screen size. There are many choices, and several choices for HDTV. Always pick the smallest size that can show your content. Then press ESC to close the window. You will need to either take off all HUDs, or you can chose a setting in the viewer to make them invisible. Pressing Alt-Shift-H will make your HUDs invisible. Press Alt-Shift-H to make the HUDS visible again. There seems to be bugs in the UI on many machines that prevent the full screen Alt-Shift-F1 from working all the time. But there is another way to get into and out of the full screen mode. Enable the advanced menu with Ctrl-Alt-Shift D. Then Select Rendering->Features->UI, and your tool bars will all go away. Now how do you get the UI back? You could relog, but that's a pain. Instead, press Ctrl-3 and then click on a prim. The UI will reappear. Now press ESC so you are no longer editing. You are now ready to record your bodacious video! There are lots of things that you can do to make a good video. 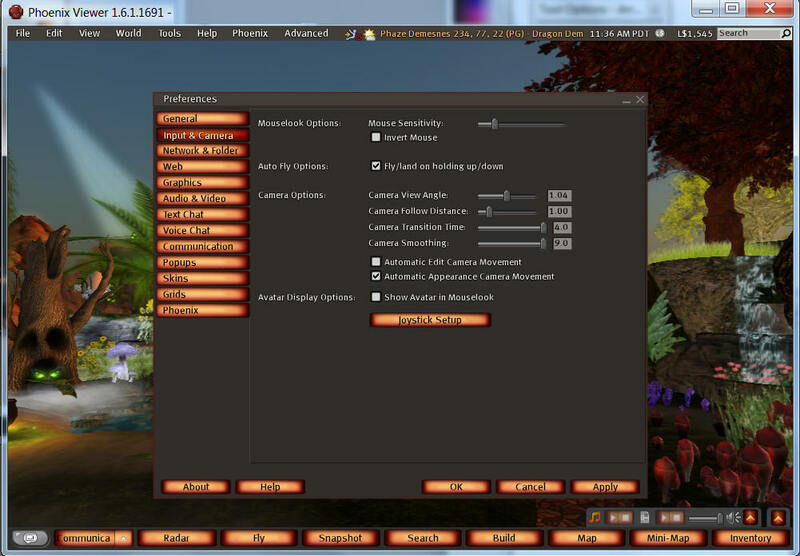 There are many settings in the viewer that can help, such as Windlight, shadows and Depth of Field. All of these can make a movie prettier. 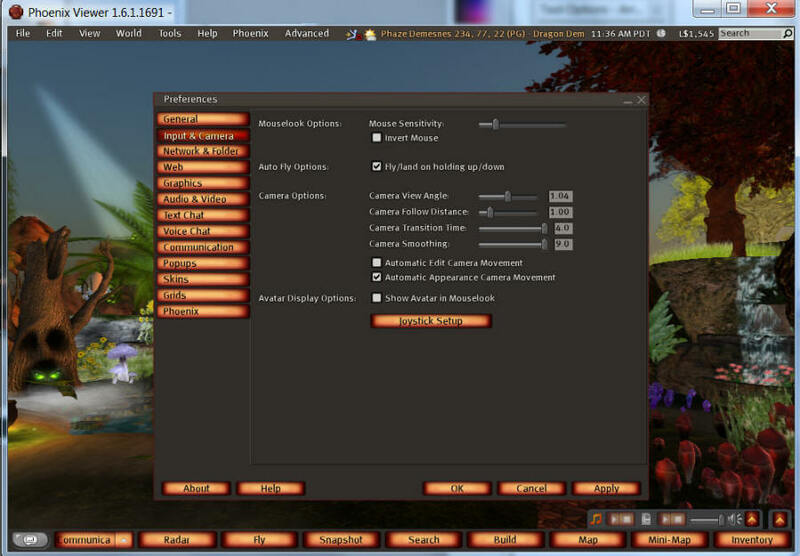 The marketplace also has many camera tools available. Here are some tips and scripts to help you with camera control. Want to make a long shot? You need to disable the camera constraints. You will be able to see very far away by disabling the 'feature'. You will probably need to increase your draw distance to see everything around you. Now close out the ctrl-P window and play with your camera. Click the ALT key, hold it down and click on some object. Keep holding ALT down and move your mouse and scroll wheel. The camera will now move much more smoothly around some point in space. Lets pull all this together and use these tricks and settings to do a long zoom shot. Pull your camera way back from your avatar.Set it up high in the sky, for example. 2) Press Ctrl+P and set your camera smoothing and Camera time to the max. 3) Press the red record button. 4) Press ESC and watch as your camera smoothly falls from the sky. The above little exercise is great for all those narcissists out there. But how can you use this trick to take video of other things and avatars? It's easy - just make your avatar invisible! You will need to go into Edit Appearance mode. 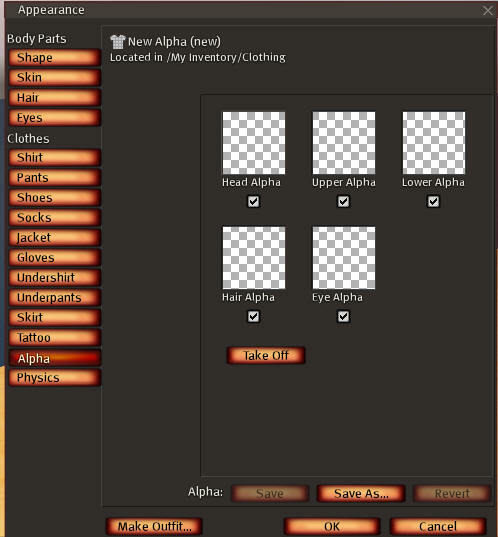 At the bottom left of the Edit Appearance window is a setting for Alpha Layers. Click it. Click each check box until your avatar is invisible and click OK.
Now take off any prim hair or other prim objects until you are completely invisible. 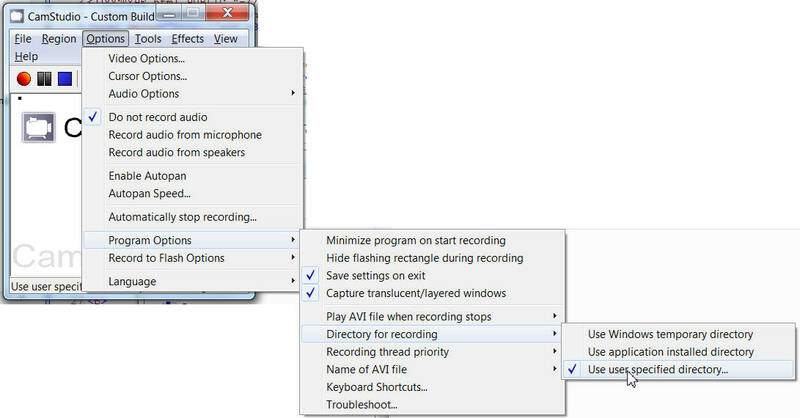 You can now use the camera zoom + ESC trick to record other items without being in the video. There are a variety of scripts that can help control the camera while you are filming. Here is a simple camera attachment by Frost White to set your camera above your head for repeatability. Just put this in a prim, and attach it to one of the HUD positions. When you wear the prim, your camera will be above your head. It will move behind you when you start walking. Fred Gandt has a neat little y script at the free script library for setting up a nice camera for machinma at this link. This script lets you leave your camera at some fixed position, and also have it track your avatar. Once the script has been executed to make this prim shape, it deletes itself. This is a very nice script from Fred, as everything is ready for the final script in seconds. I found that the HUD would attach to the wrong position, so I also added my automatic HUD positioner script to the prim. You can get it from my free script library at this link. 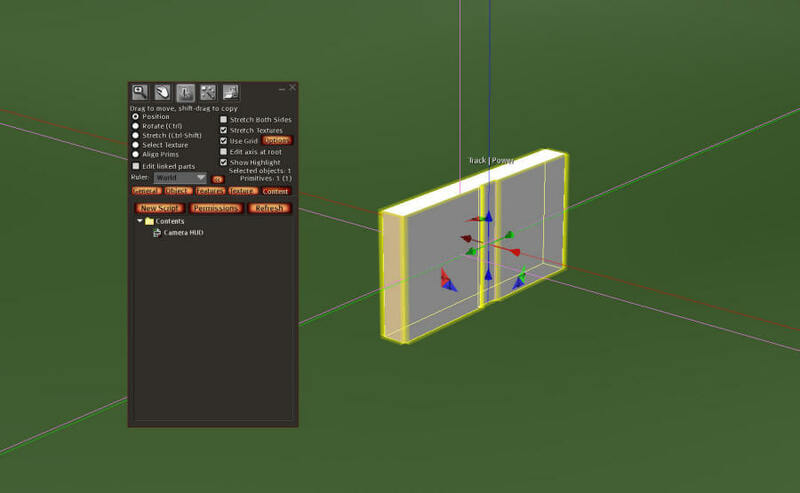 This script will move the prim to a safe position on the screen no matter where you attach it. After adding and compiling the scripts to the prim, take the prim to inventory and attach it to any HUD position. The Power Button will enable and disable the HUD. Track switches on and off tracking of the owner. With tracking off, the camera is locked solid. With tracking on the camera position is locked but it rotates to follow you around if you move. I think that the best and cheapest (free) tool for editing your video is Windows Live Movie Maker by Microsoft. It is simple to use, has very good effects, and can directly publish your video to YouTube and other file sharing sites. It is free, and is can be installed from this link by Microsoft.